This year for the big 4-0, my wonderful Leelee decided to break out her baking skills again. Usually I have angel food cake, pretty much every year. Leelee has been trying to break me of that and this year she succeeded ... Mainly because I was too busy doing the school thing to worry about birthday cake. I headed off to my night class on American Realist Writers and tried to stay awake. I came home to find a complete cupcake flop. I'm not sure what went wrong, but it was gooey and sunken. Edible only because it was chocolate. The next day, she tried again while I was at school working on a research paper (History of Educating Women in the United States and Projections for the Future). For some reason she didn't think to look in the freezer for butter and ended up substituting plain shortening. I was very pleased with the result! It was more cake than brownie, but just barely. Paired with a lavender icing...just a wonderful combo! So very glad I planted lavender this year. 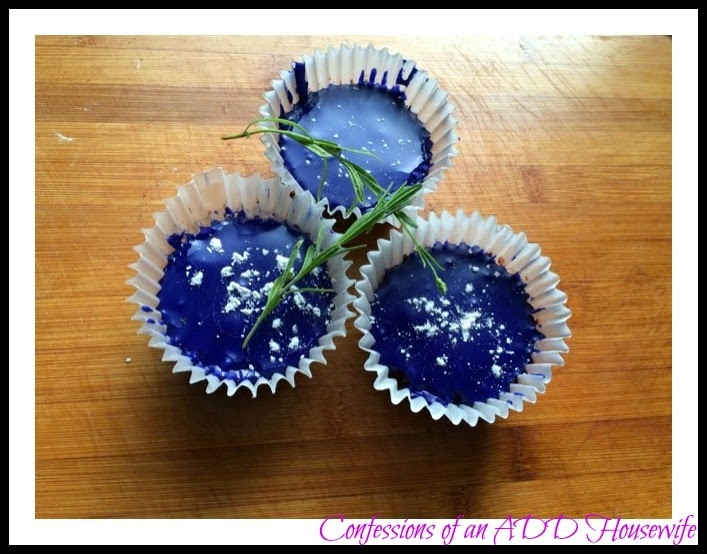 This recipe originally called for dried lavender. I've never seen dried lavender in stores. When substituting fresh herbs for dried, you typically need to triple the amount of dried herbs. Fresh herbs are generally better, in my experience, so I tend to go with fresh even if the dried is readily available in stores. In a metal bowl over a pan of simmering water, melt butter and chocolate. Stir until smooth. Remove from heat and cool slightly. Beat chocolate with an electric mixer for 3 minutes on medium speed. Add eggs one at a time, beating until combined. Beat in Vanilla and reduce speed to low. Add dry ingredients and beat until just combined. Divide batter into muffin cups. Bake about 18 minutes. Cool completely before frosting. Bring milk and lavender to boil. Remove from heat and let set for about 10 minutes. Using a strainer or cheesecloth, strain the milk and throw away the lavender. Quickly whisk in the sugar until smooth, then strain again. Add the gel-paste coloring.